I thought it might be fun to ask some holiday related crafting questions. If you’d like to answer in the comments feel free. If you’d like to post the answers on your blog please leave a link in the comments so we can all come by and read them. I don’t have any decorations that I’ve made. We do have some ornaments on our tree that were made by The Husband, H and N. There may be a tiny cross stitch Santa I did back when I was first married. In my house we have more food traditions than crafting. I’ve always made things in general. There were lots of Christmas tree decorations. But one thing that sticks out in my mind is a bird house made from Reader’s Digest magazines. The pages were folded individually and then it was glued to a paper plate. Finally it was spray painted and a fake bird was attached to the plate. We then used it to hold Christmas cards. I made one every year for 4 or 5 years. I tried to find a photo online but couldn’t. Did anyone else make these? For the most part I don’t knit for holidays. I used to knit for my mother on occasion. I don’t like the pressure. I am a very selfish knitter (and crafter). Unless the person loves, uses and truly appreciates something they get nothing else. Have you seen Kathy’s mini mittens? I love it and would love to knit one. 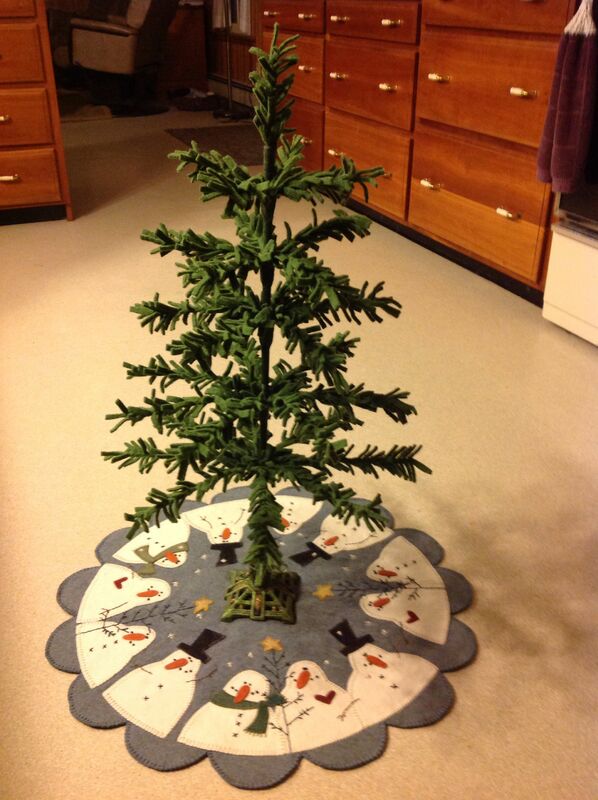 This entry was posted in crafty goodness, Q & A. Bookmark the permalink. This year I bought a deeply discounted fall wreath at Michaels, removed most of the decorations and added my own. It turned out great, blues and silver, perfect for the newly whitewashed fireplace. As a child we made all the decorations for our home. I made stencils for the windows and with my siblings we made yards and yards of paper garlands while my mother baked tons of cookies . It was such fun. I occasionally knit for gifts, but mostly I sew gifts. This year my children and granddaughter will get hoodies and my husband a red holiday hat. Have you made holiday decorations for your home? What have you made? Do you have a tradition of making something every year? I don’t do it on purpose, but quilts are the Holiday decor I make. I have 4 of them now. Did you craft for holidays when you were a child? Do you have a memory of something you made? Yes, at school we were always making crafts for Christmas. Can’t really remember anything special. Do you gift items that you make? Do you surprise the recipient or do they request something? How do you judge their worthiness? Have you ever regretted gifting someone? I do gift, but generally it’s just the yearly hats I make for the 5 Great N’s. If I love that person I am happy to knit for them. I have regretted gifting, but not at Christmas. That is a great tree! * we did lots of crafty things when I was a kid. Paper chains, of course, but I remember one thing we made in 3rd grade, gluing small scraps of orange tissue paper onto a styrofoam ball, then varnishing it and spraying a bit of gold spray paint. Add a pipe cleaner hook and that’s it. Mom still has the original, and we have tried to replicate it with no luck. Something special about the glue we used in 1967? * I do gift a lot of what I make. I give my aunt an ornament every year, and often give ornaments to mom and put them in the family Yankee Swap. I have made oodles of hats for my brothers’ kids, too. And a few different things for my sister’s daughter. So lots of knitting and sewing and crafty projects happen this time of year! I also try to make my Christmas cards, but won’t this year. That project has to happen in October, it is so labor intensive. I have only regretted gifting something once, to a family member who let the dog chew it to shreds. I don’t create for that family member any more. * A crafty project I want to do but haven’t? Well, my ravelry queue is full of things I want to make! Yup. So they used it for the dog’s bedding. I couldn’t believe it when I saw it. Thanks for another cool crafty Q&A – I love these! I haven’t made any holiday decorations for my home, but I have a precious Christmas Gnome which my daughter Miranda made from a craft kit she had as a gift on, I think, her first Christmas when she was living away but came home for the holiday (she would have been 18 and studying at Art School, and the kit was definitely for children). This gnome is pretty professional-looking! We only really did Christmas crafts at school, and making paper chains at home. Somewhere in my flat I have a paper angel made at infants school by either myself or my sister, but it’s in a memory-keeping box rather than in with the Christmas decorations. I very rarely gift hand-made items (so haven’t regretted giving any!) but this year is an exception as I am making one hand-knitted gift. It’s a surprise, but fits exactly into their preferences, and I think it will be practical if nothing else. I think I would like to make every single crafty project I ever see! I know my own limitations pretty well though, and I’d rather not spent months of frustration trying to knit Scandinavian-style baubles, for example, when I could be knitting myself a jumper and a pair of socks! I am definitely a garment knitter above all else. I used to be crafty. Now I am just knitty. I bought an artificial wreath once and strung it with tiny lights. It hung on our front door in Minneapolis every year. Now I have no idea where it is. I think I used to wrap the pillars on either side of the front door with lights, too. Such energy I used to have! Back in my needlepoint days I made a couple ornaments for the tree — a pink cat and a traditional ornament. My biggest project was a pair of needlepoint nutcrackers. They were intended to be stuffed and to stand upon the stairs, but I decided to have them framed instead. They are probably in the attic somewhere; hope the moths did not discover them in the intervening years. I have vague memories of glue laden school Christmas projects as a child but the only crafts I totally remember we’re in Kindergarten we make drums out of Quaker oatmeal boxes and a piggy bank out of an empty bleach bottle. After I had children I turned into a Brownie Leader probably just so I could craft, lol. Now I have an entire Craft Room but I mostly use it for the fabulous gift wrapping station I set up and of course my stash cubby. I’d rather knit than craft. I do try to make the grand babies sweaters for Christmas but this year I started in the summer and made sweaters and projects for nearly every one. My family and friends treasure my projects, thankfully. I tend to knit for people with babies so it goes fast. I knit a lot of baby hats, but those go to the NICU at Hopkins Hospital. We have granddaughters born within three weeks of each other, and I’ve made things for them – but they are in their late 20s now, and one of them is a mother herself. We don’t exchange gifts with adults; there are just too many of us! I do make things for the great-grandchildren. My grandmother made some choir boys from taller magazines, similar to the bird house you mentioned. Folded the top corners to the spine of the magazine, and put a styro ball on top for a head. She pulled knitting wool into “frazzles” for the hair. I answered on my blog. Here’s the link. I love these!! They are so much fun! What a great blog post – I discovered it today after you visited my blog at Walking by Inner Vision. I will write a blog post in response – it is not in time for Christmas, but you have raised some questions I would enjoy writing about anyway. More on that later on…thanks!